As devotees of Pride & Prejudice, we are all familiar with the names of the characters. From the five Bennet daughters, Mr. Darcy, the Bingleys, and certain other characters, such as the detestable Mr. Wickham and the stately Lady Catherine, we are as familiar with their names as we are of their own. I am, of course, speaking of their Christian names. In many instances, however, Jane Austen did not see fit to name some of her lesser characters, contenting herself with such appellations as Mr. Bennet, Mrs. Bennet, or Colonel Fitzwilliam. But since people began to start writing variations of Jane Austen’s work, they have had the impulse to fill in the blanks, to name some of those previously unnamed characters. Recently, with my novel The Companion, I received a review which praised the novel, but blasted my choice of name of one of the characters. I have made a conscious choice not to follow fanon, in part just to be different as I think we all try to differentiate ourselves, and in part because I see the characters differently, which affects the names I prefer to give them. As a result, I thought it would be fun to go through and look at some of the characters, research them to see if they actually do have names, and if not, what they are usually called in the world of Pride & Prejudice variations. This is the one that got me in trouble with my last novel. Anyone who reads variations knows that most authors give Colonel Fitzwilliam the name Richard. But what does Jane Austen say? If you do a search of P&P, you will find that the name appears in the text once, long before Colonel Fitzwilliam enters the story. Thus, I would dispute what my reviewer said, for Jane Austen certainly never named him. My name for Colonel Fitzwilliam is Anthony. If you’ve read any P&P variations, you’ll definitely have seen Mr. Bennet referred to as Thomas—it’s a trend which has most authors following suit. In the novel he is not named. In my novels, he is called Henry. My sister, who I have finally convinced to write a variation, considers him to be an Oliver. Sorry, but I don’t see it! Lol. Another character who is not named. Typically, most authors call her Fanny—perhaps because of another character in a different novel of the same name? I’m not sure, but I call her Margaret—Maggie. Mr. Gardiner is the one of which I am uncertain. In the index of characters on Pemberley.com, his first name is listed as Edward. However, if you do a search of the text of P&P, the only time Edward appears is in relation to Mrs. Younge’s residence on Edward Street. I have used several names for Mr. Gardiner in the past, but when I found the reference on Pemberley.com, I’ve used Edward ever since. But now I’m not so certain, and I couldn’t find any reference which would explain why the site lists his first name as Edward. If anyone knows, I would appreciate it if you could explain it! When Mrs. Gardiner responds to Elizabeth’s letter, asking for the details of Darcy’s involvement in Lydia’s marriage to Wickham, she signs her name as M. Gardiner, and to the best of my knowledge, it’s never mentioned anywhere else. This one has tripped me up in the past, as I know at least in one novel, I gave her the name Sarah. Since I realized this reference, I’ve always used the name Madeline. I know there are several others who do the same, but I’ve also seen other names used too. The preponderance of writers call Mr. Darcy’s father George, and I suspect that comes from the thought that his godson, George Wickham, was named after him. To me, Mr. Darcy the elder is Robert. Unnamed. To be honest, I can’t remember a single story in which she was actually named, and I have never named her myself! I include this character as one that is only mentioned in passing. Colonel Fitzwilliam’s father is never named, and in fact he is only ever referred to as Lord —-. 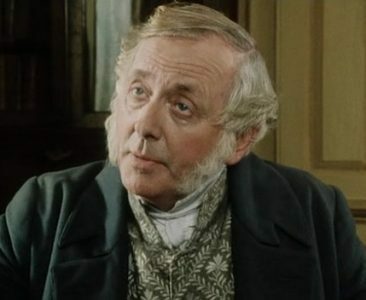 The reference to him being the Earl of Matlock is, near as I can tell, an invention of the A&E version of P&P, where Mr. Collins informs the ladies that the son of the Earl of Matlock is about to visit the parsonage. I’d be interested to hear if anyone thinks I have missed anyone important. Please comment if you do! 21 Responses to What’s in a Name? When I first started writing JAFF I was ignorant of the conventions of what every character’s first name “should” be. Consequently I had someone who took me to task for giving Colonel Fitzwilliam the first name of Edward. Too bad! Edward he was and Edward he stayed. I could definitely think of him as an Anthony, however, and I like all the other first names you suggested. I do not really have a problem with the authors choosing their own “name” for JAFF characters but it does sometimes jar on my sensibilities as I am used to hearing/reading “Richard”, “Madeline”, “Fanny”, etc. 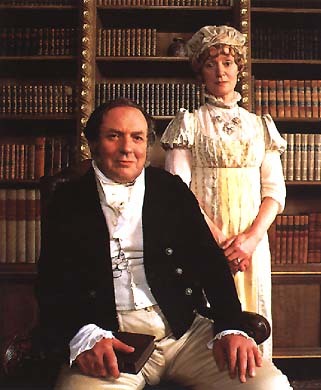 In the 1995 BBC/A&E version, didn’t Mr. Gardiner refer to Mrs. Bennet as “Fanny”? It’s the scene where the Gardiners have just arrived from London for the Christmas holidays. Mrs. Bennet goes through all of her woes and then says, “…but I never complain.” Mr. Gardiner then says something like “Very well, Fanny”. Thank you! Yes, I believe you’re completely correct. That must be the reason so many authors use Fanny. As a reader, I do have my favourite names that I like for those characters Jane did not give us a first name for. I will admit to re-reading a sentence when a new one is offered up by an author. However, it’s more of the sound of brakes screeching to a halt until I wrap my head around it. Like Glynis, as long as the story engages me, I overlook it. I do like learning why an author chooses a specific name. Lol. Yeah, I can definitely see that. It can seem a little weird until you get used to it. Love this post! It’s near that you found names to fit those characters.I think the names you chose suit the characters well. I tend to go with the masses. I.e. Richard, Thomas, Fanny, Edward Madeline and George as most of the versions I have read go with those but it doesn’t bother me if authors use different ones. I can see that different people sleep have a name that matches their version of the character probably based on someone they know. Whatever names are used I’m more interested in how good the story is. I love this post, and I love that you break tradition with other JAFFs to come up with the names that you think best fit your characters. In my Elizabeth, Darcy, and Me series, I, like Regina, named Colonel Fitzwilliam Edward and did get a little flack about it. Since then, I decided to go with the flow and name him Richard in my other JAFFs, but I enjoy re-naming Mr. Bennet, Aunt Gardiner and the like. We need to put our own stamp on our JAFF characters! I’ve definitely seen Edward used a few times. It’s nice to be different. We’re changing up the story so much, that a bit of originality with the names adds to it. I have to agree with you about Colonel Fitzwilliam’s first name. In my mind he’s never been a Richard. Anthony is a much more fitting name for the dear colonel IMO. Kudos to you for bucking fanon and writing your story your way. I read so many where his name is Richard that it seemed natural to me. But yeah, now I definitely see him as an Anthony! Interesting post. I love to hear the reasoning why some names are chosen and it’s sad that some readers confuse fanon with canon and berate authors for being wrong. Thank you! It’s often very difficult to keep them straight, especially once you’ve read hundreds of variations. I’ve had times where I’ve confused the book with the miniseries too. Either way, it’s best to just enjoy the story and not focus on the names, in my opinion. I got lambasted in one particular review for calling Colonel Fitizwilliam “Edward.” The person said that his name was “Richard,” and I was wrong, for Jane Austen had named him as such. The person accused me of not having read Pride and Prejudice. I beg to differ. I have read the novel at least once yearly (usually more) since I was 12. That is 58 years by my last accounting. LOL! In all my books, the good colonel is “Edward,” which is my late father’s name. My father passed at age 47. It was my way of honoring him. As to Mrs. Gardiner, I have always called her “Madeline,” even before many others picked up the name. Again, I claim a familial relation: I have an Aunt Madeline, who also passed too early. I knew the initial “M” existed in the novel, and it just seemed natural for me to choose that one. My mother and I lived with my Aunt Madeline for a few years after my father’s death, and Madeline always held a special place in my heart. “I have seen them both. They are not married, nor can I find there was any intention of being so; but if you are willing to perform the engagements which I have ventured to make on your side, I hope it will not be long before they are. All that is required of you is, to assure to your daughter, by settlement, her equal share of the five thousand pounds secured among your children after the decease of yourself and my sister; and, moreover, to enter into an engagement of allowing her, during your life, one hundred pounds per annum. These are conditions which, considering everything, I had no hesitation in complying with, as far as I thought myself privileged, for you. I shall send this by express, that no time may be lost in bringing me your answer. You will easily comprehend, from these particulars, that Mr. Wickham’s circumstances are not so hopeless as they are generally believed to be. The world has been deceived in that respect; and I am happy to say there will be some little money, even when all his debts are discharged, to settle on my niece, in addition to her own fortune. If, as I conclude will be the case, you send me full powers to act in your name throughout the whole of this business, I will immediately give directions to Haggerston for preparing a proper settlement. There will not be the smallest occasion for your coming to town again; therefore stay quietly at Longbourn, and depend on my diligence and care. Send back your answer as soon as you can, and be careful to write explicitly. We have judged it best that my niece should be married from this house, of which I hope you will approve. She comes to us to-day. I shall write again as soon as anything more is determined on. — Your’s, etc. 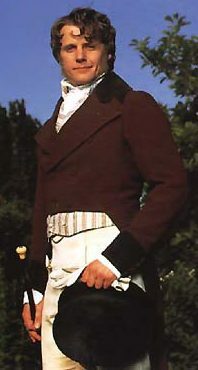 I choose “George” for the elder Mr. Darcy more for his daughter being “Georgiana” than for “George” Wickham. Earl of Dovedale does not have the same masculinity as does the Earl of Matlock, now does it? RJ…OK, for me as a relative “newbie,” I followed the JAFF canon (note the clever lack of capitalization). However, it was left for me to play with place names! Yes…Longbourn, Rosings, and Pemberley…oh, and Purvis Lodge. I have a Duke of Thornhill in my Realm series, Don, but he lives at Thorn Hall in Kent. I have also presented the colonel’s older brother Roland with a courtesy title and an estate in Lincolnshire (one of the many owned by the earldom). There is another estate belonging to the Fitzwilliams, which my characters frequent often. It is found in Scotland. It is used in my “Christmas at Pemberley,” “The Disappearance of Georgiana Darcy,” and most recently in “A Dance with Mr. Darcy.” Luckily, I keep a “history of…” each book, where I collect character names, brief descriptions, place names, horse’s names, etc., a timeline, and a short summary of each chapter. In that manner, I keep the same names throughout my books. Yes, that would be why Mr. Gardiner is named Edward, though I suppose it could also be Edwin. 😛 Thanks for that, Regina, as I had missed it! And Don, I have a file of estate names too. My Colonel Fitzwilliam often has a small estate of his own which I call Thorndell, the Matlock estate is always Snowlock, and I’ve used a couple others, thought I usually don’t name houses in town. Here’s a bit of trivia for you: In “Waiting for an Echo” which I wrote with Lelia Eye, one of Lady Catherine’s neighbors has an estate called Stauneton Hall. Bonus points for whoever can guess where that comes from. P.S. If you’re having trouble, some of the letters of “Stauneton” are an anagram! Does Stauneton = “Not Austen”? When my daughter read P&P, she asked me why the regiment was referred to with a blank [ In Chapter 50 of P&P, the regiment that stayed in Meryton is referred to as “the — — shire”]. She asked if the name was so risque that it couldn’t be printed. The regiment that Wickham ends up in is referred to as General _____’s army. BTW The grocery chain in my town had the idea of putting up a life-size cardboard picture of their store manager and giving his name. They stopped this promotion – perhaps because one store’s manager was constantly interrupted by Jane Austen fans wanting to meet a real-live “George Wickham”.